When a crime is committed, we often go to the authorities for help. But where can we go if the authorities committed the crime? ເມື່ອເກີດມີອາຊະຍາກຳ, ສ່ວນຫຼາຍ ເຮົາຈະໄປຫາເຈົ້າໜ້າທີ່ເພື່ອຂໍຄວາມຊ່ວຍເຫຼືອ. ແຕ່ເມື່ອເຈົ້າ ໜ້າທີ່ ເປັນຜູ້ກໍ່ອາຊະຍາກຳເອງ, ເຮົາຈະໄປຫາໃຜ? ACSC/APF forums held each year are vibrant examples of diverse ASEAN civil society groups and individuals bringing their voice and concerns to the region’s leaders and lawmakers. In 2014, the gathering was held in Yangon, Myanmar, with some 3000 participants. Three plenaries and 35 panels included nearly 200 speakers. Only one of these was from the Lao PDR. The 2015 forum took place April 20-24 in Kuala Lumpur, Malaysia. With over 1,400 participants, this event involved 69 workshops with some 250 panellists sharing their thoughts and analysis. Again, just one of these was a Lao citizen. Yet many believe the Lao PDR is suitable to host the next event in 2016. 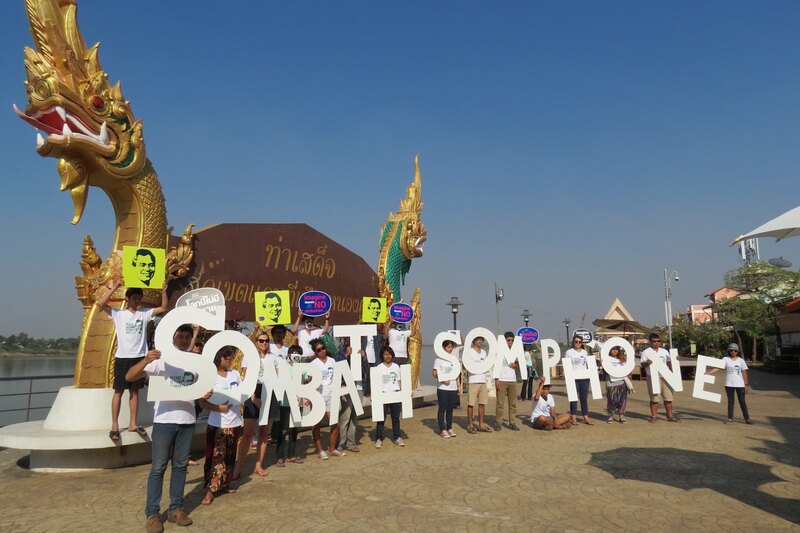 Since Sombath Somphone’s abduction on December 15, 2012, many inferences have been made, both in public and in private, about why he was taken. Just days after he disappeared, government officials speculated it may have been due to a personal or business conflict. Variations on this theory have been repeated many times, both by diplomats and those purported to be responsible for the official investigation. Even at the Universal Periodic Review before the UN Human Rights Council in January, 2015, it was suggested it may have been a conflict with a criminal group. Yet after more than two years of what is claimed to be a serious and thorough investigation, there has been no information or evidence given to support such allegations. None. n its 58 year history, the prestigious Ramon Magsaysay Award has been given to over 300 distinguished persons from across Asia. Two of these have been Lao. The first was Keo Viphakone, who was given the prize for Government Service in 1967. The second is Sombath Somphone, who received the award for Community Leadership in 2005. Sombath was stopped by police and then abducted in December 2012. How much more is being hidden? If Lao citizens, Lao media, and Lao civil society organisations, as well as UN and NGO agencies working in Laos, are not able to speak about Sombath Somphone, how many other enforced disappearances, unlawful detentions and other human rights violations are being hidden?